I thought about resurrecting the subject on the originating thread, but it seemed better to separate this out. I have recommended "Murphy" brand oil soap for cleaning estate pipes a few times here and there, as I have never had it damage a finish before - it is after all meant for cleaning furniture and floors with fine finishes on them. 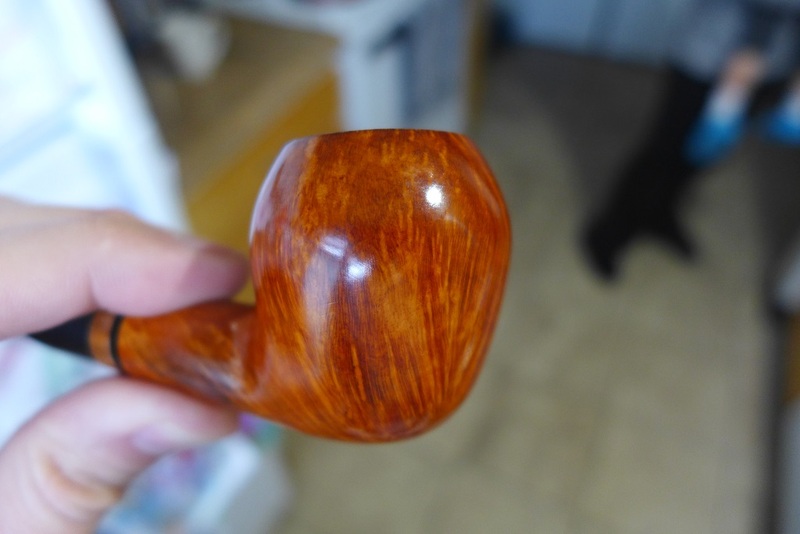 So following the method that some others here have used, which resulted in stripped finishes, I set out with an experimental pipe. I don't really like high gloss finishes on pipes, so I offered up the Viking Classic Acorn pipe that I received in trade from @MikeDennison. I had intended on sanding it anyway, so I hoped that this process would indeed strip the finish off, thus saving me much time in sanding. For the process, I am putting full strength(no water at all) Murphy Oil Soap on to the pipe, scrubbing vigorously with a stiff toothbrush, adding more soap, letting it sit for an hour, scrubbing more, then rinsing. During the first treatment I noted zero change in foam color, and even after a long period sitting and then re-scrubbing and rinsing.. the finish is.. the same. 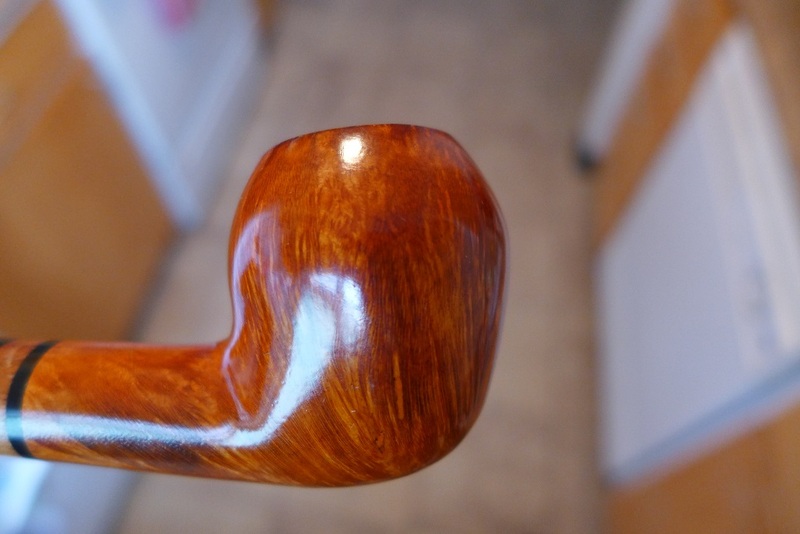 Not satisfied with the result, I again applied full strength oil soap to the pipe, scrubbed even more vigorously, added yet more soap, let sit for an hour, and then scrubbed and rinsed. The finish is.. the same! The only place I noticed any finish change was on the rim, where prior to the treatment it was already charred and the finish was bubbled. In this case I fully attribute the removal of finish just to plain scrubbing. If watered down as indicated on the bottle, I couldn't see this stuff doing damage of any kind. Just for the record, the Kaywoodie that I used didn't have a lacquer finish just wax. I say drop it in some grain alcohol first to remove the lacquer then switch to Murphy's to get down to business. No way I am gonna waste good alcohol on my pipes. A lot - probably most - old Kaywoodies had shellac or lacquer finishes. I think the main difference is that most vintage pipes were sprayed with nitrocellulose lacquer(or shellac on rusticated pipes), and most modern factory pipes are sprayed with acrylic lacquer. There is a possibility that nitrocellulose lacquer is more susceptible to the surfactant-like oils in the soap. Nitrocellulose also has a tendency to yellow over time, and is prone to lose adhesion the older it gets(which I have seen a lot on vintage guitars, and on the few old cars that were still finished with it). Even still, I have used Murphy Oil Soap (cut with water) on some vintage dime store acoustics that were 100% sprayed with nitro lacquer, even with chips and areas of de-lamination.. and I have never seen it do any damage. I had two older late 60's era Signets, and a Standard that was lacquered(actually almost every Signet I've ever seen has been lacquered). My Saxons, save for the two recent production ones that @MikeDennison now has, were definitely a shellac coating. From what I gather from reading the Kaywoodie Collector's Guide, and from my personal observation.. virtually all their pipes from around late 60s to early 70's used a lacquer or shellac finish. Not trying to be contrary, it's just what I've seen. Definitely, all the modern ones I've seen have been waxed. Actually, the really recent production one that are on WVSS have really caught my eye lately. I know right !! I hope Kaywoodie gets it's act together. There prices went up and they needed to . The overall quality of the pipe is good , especially for the money. I'm glad the stinger is out of the picture , though I hope they still have it on the drinkers line , other wise why have a drinkers line . A couple years or so ago , their red roots were really hot snot looking and I scored an acorn but missed the tulip ... Ive been after a tulip ever since ... It bugs me, lo.